If your dog is having trouble getting up after laying down or is resisting going up or down stairs, give Phycox soft chews a try. Who is it for? : Dogs with joint issues (arthritis, hip dysplasia). Can also be used as a preventive measure in dogs prone to joint issues, such as Labradors, Golden Retrievers, Great Pyrenees etc. Why I Love it: Two of my own dogs take Phycox soft chews daily. One is my 15-year-old Shepherd mix with arthritis, and the other is my 8-year-old Rhodesian Ridgeback mix that has always been a little stiff in the rear limbs. The chews are soft, and my dogs take them just like treats. Both dogs are on other meds as well and I can actually use the Phycox to hide the other medicine in. The dogs don’t even realize they are being medicated! The product even has a palatability guarantee if purchased from your veterinarian. If your dog doesn’t like the taste, return the product for a full refund! They also have a hypoallergenic variety for dogs with food allergies and small bites for smaller dogs. Phycox is the only joint supplement that contains phycocyanin, a natural antioxidant from blue-green algae that helps destroy free radicals in the body. They also contain glucosamine, MSM, and omega 3 fatty acids, all of which are beneficial for joint health. How can you get it? 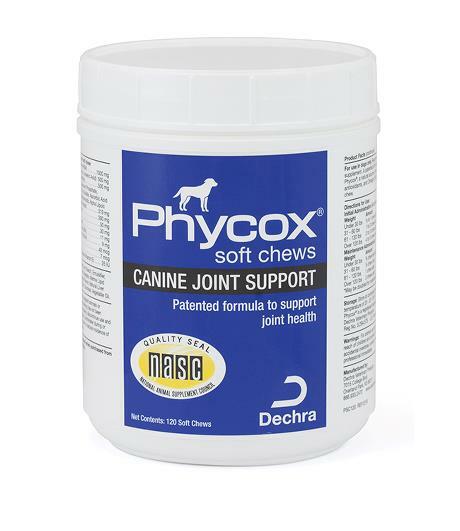 : You can purchase Phycox chews here or from your veterinarian.